When you start to lose your hair at a young age, it’s hard to know what to do. Do you just roll with it, or treat it? Androgenetic alopecia, is a condition responsible for hair loss and is more generally known as “male pattern baldness”. It can begin in adulthood and sometimes even … in adolescence. When the onset of baldness starts so young, the psychological consequences can be disastrous. The cause of hair loss can be due to several reasons: stress, post-traumatic shock, vitamin and nutrient deficiencies, thyroid problems, drug treatments. In these cases, the loss is often sudden and it’s necessary to consult a doctor. Androgenetic alopecia, on the other hand, is the result of a genetically determined sensitivity. Around 25% of men between 25 and 35 years of age are affected by this form of baldness, and approximately 20% at around 20 years of age. First, we need to understand what androgenetic alopecia is and why it occurs. What’s the source of the problem? Hormones and heredity. In humans, testosterone turns into dihydrotestosterone and in genetically “programmed” people, it attacks the hair follicle as a poison. A poison that gradually kills the roots and weakens the hair and eventually causes the hair to fall out. This link between testosterone and baldness was highlighted by Hamilton, who was the first doctor to create a scale representing the different stages of male pattern baldness. Baldness is a benign pathology, harmless to health, but whose negative impact on morale and self-esteem is real. And if you are affected by this form of hair loss, it will be difficult to avoid it. However, there are solutions and treatments to remedy an early baldness. Baldness affects 1 in 2 men at the age of 50. In other words, the market is huge. An abundance of “miracle” remedies are offered to men (and women) who suffer from it – lotions and shampoos, food supplements – and are sold with well-targeted marketing campaigns. Most of these products do not represent a danger for people who use them, however they do not solve the problem. At most, your hair will have a better texture and a brighter appearance. But the hair will continue to fall. A large number of clinics continue to offer invasive and aggressive techniques such as FUT (the “strip” technique) which results in scarring and lower survival rates. With DHI, the hair transplant has evolved: it can now be achieved with simple local anesthesia, virtually painless procedures, and a result not only dense and natural, but also free of any scars or unsightly marks. (even on unshaven hair). It damages the donor area and deprives the patient of follicles for future use. When you are young, hair loss will continue, therefore the donor area is a reserve for future transplants. Follicles extracted aggressively are mistreated and traumatised. This is reflected in the regrowth rate, well below 70%. With preparation and planning, it is possible to avoid going bald entirely. The most important first step is to speak to a hair loss expert who can assess your condition and make personalised recommendations tailored specifically to your needs. Correctly anticipating hair loss and managing the donor area of a young patient suffering from premature baldness is paramount. Direct Hair Implantation is absolutely safe and guarantees you 100% natural results. Implantation of the hair follicles happens with a special tool, the DHI Implanter, which allows our specialist DHI doctor to control the angle, direction and depth of the implanted hair unlike any other hair transplant technique. Your results are guaranteed to look natural. 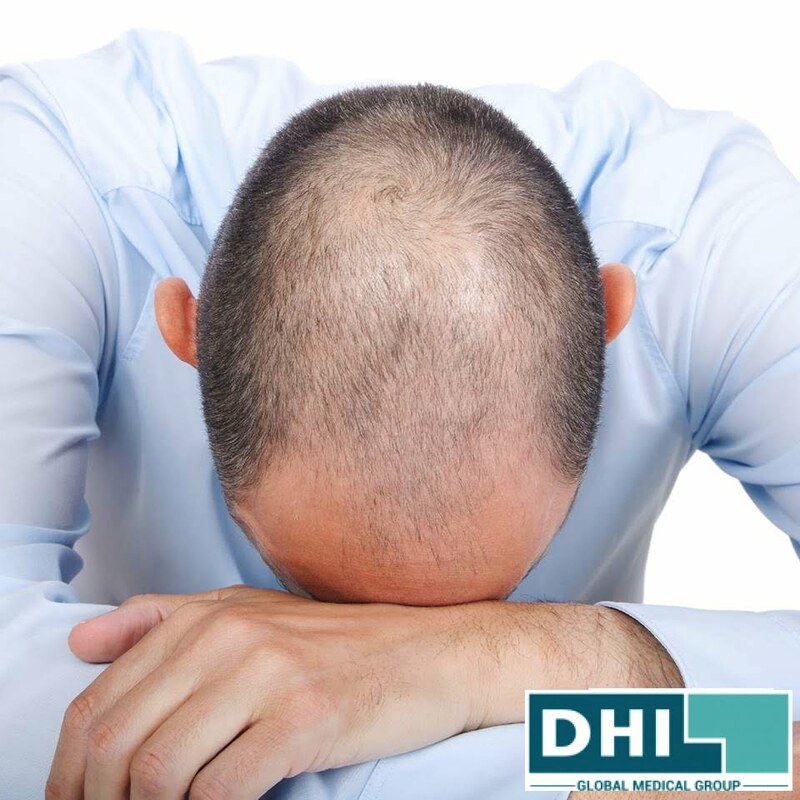 DHI use a patented technique – the most delicate hair transplant method available and they consistently achieve over 90% survival rate. The result of a hair transplant is from one year following your procedure. It is therefore important to be able to contact and meet with your transplant clinic during the first year following your procedure. Minoxidil is used as a topical solution on the scalp as a treatment against loss of hair. Young people suffering from early alopecia are recommended to use it to keep their original hair on their head for as long as possible. Essentially intended for men who still have a reserve of hair, finasteride can be used alone or in addition to a hair transplant. It is a drug which is taken orally and works by reducing the conversion of testosterone into DHT (dihydrotestosterone) and thus prevents damaging the hair follicles. Used for 5 years, treatment with finasteride helps stabilise hair loss in the majority of men. However, continued use is recommended to maintain therapeutic benefit. If the treatment is stopped, the results gradually diminish and the loss begins again. Finasteride is not to be taken without medical supervision. Side effects are rare and should be reported immediately to your doctor. An alternative to daily lotions or pills is Platelet Rich Plasma (PRP) which uses the body’s own cells to promote healing and stimulate hair growth. It is minimally invasive and is combined with fractional skin needling. PRP therapy can be used to strengthen hair follicles as well as rejuvenate dormant hair follicles and trigger the growth of new hair. If you are suffering from early baldness, there are solutions. Speak to a DHI Specialist today and earn back your lost confidence!